Thinking of Buying a Convential Outdoor Boiler? Read This First. The concept certainly has its appeal: locate the wood-fired boiler in a small insulated shed some distance from the house and run water pipes under ground to transfer heat for both space and water heating. Over the past twenty years more and more people have chosen outdoor boilers. By far the best use of outdoor boiler technology is for “mini district heating”, in which two or more buildings are heated from the same boiler in the yard. Farming operations in which outbuildings must be heated, or repair garages next to houses are both good applications of the technology. There are problems, though, which is why conventional outdoor boilers have been so controversial. Another reason for the smoke is the cyclical operating pattern. When the boiler’s water temperature falls below a set point, its combustion air damper opens and/or a small fan forces combustion air into the firebox. Once the water is heated back to the upper set point, the fan is turned off and/or the combustion air damper closes. During off cycles the fire smolders and much of the smoke condenses as creosote on the cold steel internal surfaces. Creosote on firebox surfaces ignites as a firing cycle starts.When the thermostat again calls for heat and incoming combustion air rekindles the fire, the heat ignites the creosote clinging to the boiler walls (that's what you are seeing in the photo at the left) and a huge belch of smoke issues from the stack for about ten minutes, before the system settles back into its normally smoky fire. An outdoor boiler firing up.All things considered, the start up of a conventional outdoor boiler after a long off cycle can be an unpleasant affair. The picture to the right shows a boiler starting after an off cycle. The bad effects on combustion of a cold firebox and cyclical operation are made worse if the outdoor boiler is too big for the heat load, a problem that seems to be common. 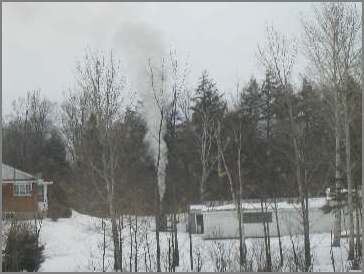 An outdoor boiler connected only to a modest-size house will spend most of its time in the off mode, particularly during fairly mild weather, so when it does fire, it is likely to make a big smoke plume. A boiler firing on a still winter morning.Another of the problems with outdoor boilers has been the outrageous performance claims made by their manufacturers, few of which appear to be backed up and some of which are just plain nutty. Several manufacturers quote “combustion efficiencies” of over 90 per cent. But no responsible manufacturer of heating equipment will ever quote combustion efficiency because the figure is utterly meaningless to buyers, and worse, it is seriously misleading. The new advanced technology boilers have not been on the market long enough see whether the makers' performance claims will stand up to the sniff test, but we hope more honesty will accompany the improved technology. The only useful efficiency number for potential buyers is net delivered efficiency, and even then the conditions under which the tests were conducted and the agency that conducted the tests must be known. For example, the results from a universally recognized and government sanctioned test method show that advanced, EPA certified stoves have net delivered efficiencies between 60 and 80 per cent and that conventional wood stove efficiency is between about 40 and 65 percent. Some boiler manufacturers brag of 96 hours (!) of heating on a single firebox load. This tends to set up unrealistic expectations on the part of buyers, leads to serious over-sizing of the unit and means that during most conditions a large part of the potential energy of the wood will be converted to smoke, not heat. 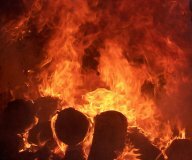 While it is theoretically possible using sophisticated equipment to spread the heat output of a single large load over two days and still burn the wood cleanly and efficiently, it is not possible with a simple combustion chamber surrounded by a water jacket. But the claim that we at woodheat find most offensive is that because they are outside, these boilers avoid all the risk of heating with a woodstove, furnace or fireplace, the implication being that indoor wood burners are inherently hazardous. Nonsense, we say, and shame on those that use this tactic. A woodstove, furnace or fireplace that is safety certified, installed exactly according to the manufacturer’s instructions and used responsibly is every bit as safe as any other type of heating system. Some outdoor boiler manufacturers are making the effort to offer their customers a decent combustion system and are proving it by having their products emissions tested and certified. If you are looking into buying an outdoor boiler, only consider those that appear on EPA's list of cleaner models. 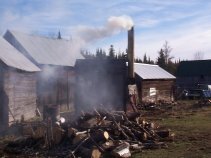 We are encouraged that outdoor boiler emissions are beginning to be regulated so that manufacturers can compete on a level playing field, buyers can base their decisions on good information and we at woodheat.org can endorse the outdoor boiler as a responsible and environmentally appropriate way to heat with wood.